Join us in commemorating the 3rd Anniversary of Cablegate in an extended vigil outside the Ecuadorian Embassy, where Julian Assange, Editor of WikiLeaks, has found protective refuge. 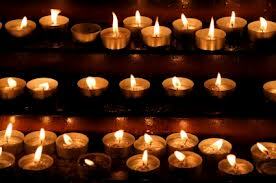 As WikiLeaks continues to shine light into the darkest corners of our society and reveal what governments and corporations are up to behind closed doors, so will we light up the night as we commemorate Cablegate with 251 candles – one candle per 1000 cables! 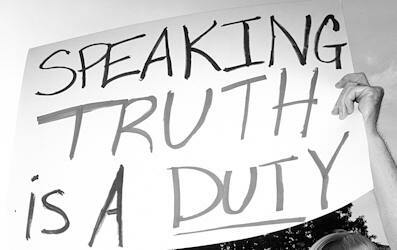 We will be standing in solidarity with Julian Assange; unable to set foot outdoors for nearly a year and a half, and thanking him and all who have been a part of the WikiLeaks vision-for-justice for their courage and faithfulness to that vision. And we’ll be remembering that the existence of WikiLeaks made it possible for Chelsea Manning (who had no success when trying to interest the larger media organisations) to get the truth out to us. We will again celebrate the amazing effectiveness of such a tiny, practically fugitive, organisation in impacting our whole world for good and being such a cohesive inspiration – a steadfast hub for this revolution. 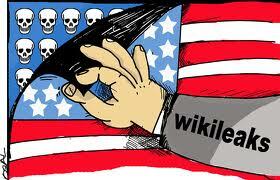 We’ll salute WikiLeaks and Julian himself for having the courage to publish Cablegate when it meant becoming the sworn enemy of the world’s most powerful government, being pursued by ours (and others), and being abandoned by his own. And we’ll be applauding the ongoing success of the WikiLeaks mission, exemplified again by the latest scoop – the publication on 13th November of the leaked 95 page Intellectual Property section of the closely guarded secret Trans Pacific Partnership draft treaty (more here with map showing relative positions of countries on issues), reaction to which (see here, here, here and here for links helpfully provided by This Day in WikiLeaks; note this WaPo article ‘5 Key Q&A on leaked TPP‘; this on Alternet…) is still coming thick and fast! remains a force to be reckoned with on the global stage. More at Event Facebook Page. This month, on Thursday 28th, we’ll be marking the third anniversary of the beginning of that epic document liberation which revealed so much about the political corruption of our world – the publication of 251,287 US State Dept Cables. 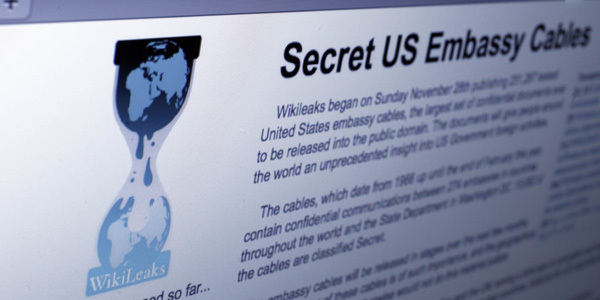 On Sunday November 28th 2010 WikiLeaks began publishing the largest set of confidential documents ever to be released into the public domain – Cablegate. Some of the revelations from the cables are listed in these early reports (here and here) from the Pvt. 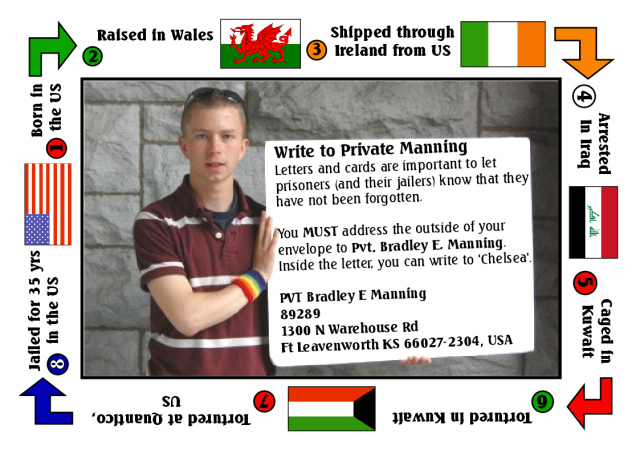 Manning Support Network, and there are a few more here compiled by Juan Cole in August this year and see also this list from Greg Mitchell; these all give some insight into why people consider the documents so important, and why the cables continue to be used by as journalistic source material all over the world. We remember, of course, that the cables informed the Tunisian activists and assisted the sparking off of the Arab Spring of 2011, the second anniversary of which is soon, remarkably (synchronisitywise) falling on Chelesea’s birthday – 17th December – when she will be 26 and spending her fourth year in prison. And it is also owing to one of the cables relating to an atrocity perpetrated by US soldiers that Obama had to pull US troops out of Iraq at the end of 2011. Because this cable was publicly accessible the Iraqi President had to refuse the usual immunity from prosecution for US troops, and they were accordingly withdrawn. (cf the current Afghan/US negotiations which don’t seem to be going the same way but are hanging on the same issue of immunity for US troops). 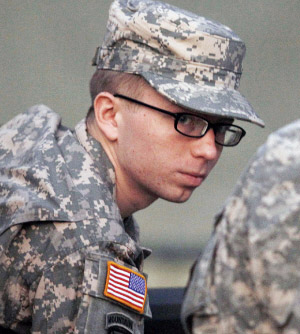 Chelsea Manning (then known as Bradley) first became aware of these documents in mid 2008, when undergoing AIT (Advanced Individual Training) to become an Intelligence Analyst in the US Military during the Iraq War. Then, after arriving in Iraq in late 2009, the newly qualified analyst was directed (along with others) to study the cables as part of this role. Captain Lim sent a section wide email to the other analysts and officer in late December 2009 containing the SIPRnet link to the portal along with the instructions to look at the cables contained within them and to incorporate them into our work product. Based on this instruction the then Pfc Manning read ‘virtually every published cable concerning Iraq’, and ‘also began scanning the database and reading other random cables that piqued my curiosity’. that Iceland was involved in a dispute with the United Kingdom and the Netherlands concerning the financial collapse of one or more of Iceland’s banks. According to open source reporting much of the public controversy involved the United Kingdom’s use of anti-terrorism legislation against Iceland in order to freeze Icelandic access for payment of the guarantees for UK depositors that lost money. Later, however, after returning from the leave during which she had decided to leak the Afghan War Diary and the Iraq War Logs to WikiLeaks (having failed to interest the Washington Post and new York Times in them), she found (on 14th February 2010) a pertinent cable dated Jan 2010 which indicated to her that in the face of Iceland ‘essentially being bullied diplomatically by two larger European powers’ the US were not inclined to respond to Iceland’s request for assistance because of the ‘the lack of long term geopolitical benefit to do so’. I felt that I would be able to right a wrong by having them publish this document. WikiLeaks duly published 10 Reykjavik 13 on 18th Feb 2010, and this was the first of Chelsea Manning’s historic leaks to be released into the public domain. The more I read, the more I was fascinated with the way that we [USA] dealt with other nations and organizations. I also began to think the documented backdoor deals and seemingly criminal activity didn’t seem characteristic of the de facto leader of the free world. Wondering about leaking some of the cables, Chelsea (contrary to what we have had rammed down our throats about her lack of discrimination in leaking this material) studied the classification system and how the cables were marked to indicate the level of classification. 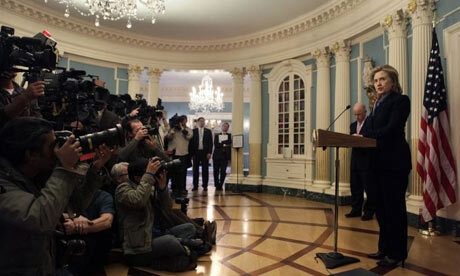 the vast majority of the Net Centric Diplomacy Cables were not classified. The SIPDIS or SIPRnet distribution caption was applied only to recording of other information messages that were deemed appropriate for a release for a wide number of individuals. I was aware that thousands of military personel, DoD, Department of State, and other civilian agencies had easy access to these cables. The more I read the cables, the more I came to the conclusion that this was the type of information that should become public. I once read and used a quote on open diplomacy written after the First World War about how the world would be a better place if states would avoid making secret pacts and deals with and against each other. I thought these cables were a prime example of a need for a more open diplomacy, given all of the Department of State cables that I read, the fact that most of the cables were unclassified, and that all the cables have a SIPDIS caption. 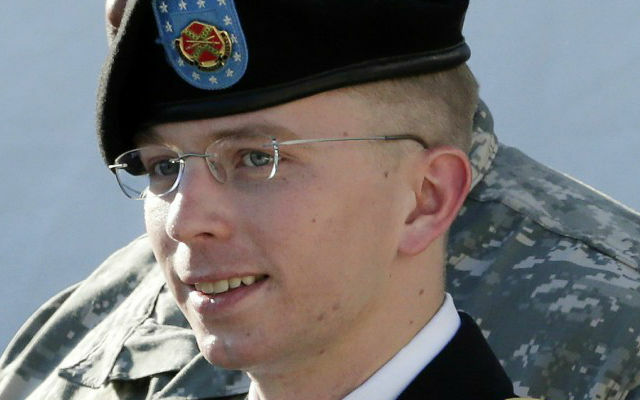 Later, between 24th and 26th May, Pfc Manning confided in Adrian Lamo who specifically offered a confidential, in fact ‘confessional’ chat. Instead, however, on 26th May 2010, he reported the soldier, leading to Manning’s immediate arrest. The young whistleblower (22 at the time), who was told nothing about what was happening to her and where she was headed, was caged in Kuwait till July 2010 (where she had a breakdown); then kept in severe, abusive and restrictive conditions in Quantico, Virginia till April 2011; and only moved into a more acceptable regime at Fort Leavenworth because of the extent of the worldwide public protest. These are some of Manning’s words from that conversation in May 2010 which preceded the arrest. say, 260,000 state department cables from embassies and consulates all over the world, explaining how the first world exploits the third, in detail, from an internal perspective? it might actually change something…. Yes. Indeed. It would. It did. Much. I saw what Chelsea Manning did. Through her hacking she became a contender, a world changer. She took tremendous risks to show the ugly truth about war. I asked myself, if she could make that risk shouldn’t I make that risk? Wasn’t it wrong to sit comfortably by, working on the websites of Food Not Bombs, while I had the skills to do something similar? I too could make a difference. It was her courage that prompted me to act. 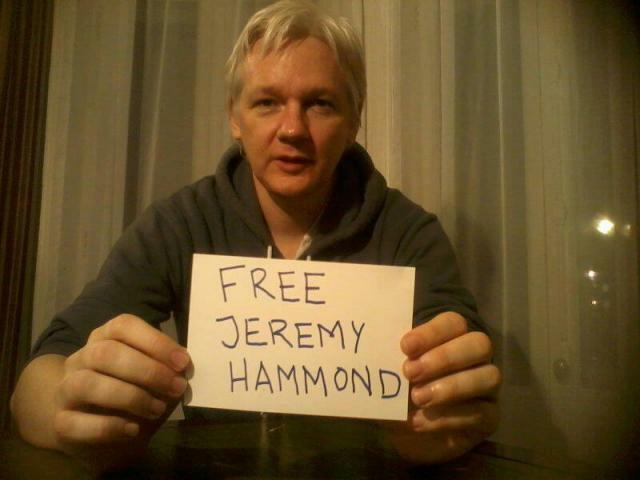 At the time of writing grief is, for this moment, the closest companion of many of us because Jeremy has just been given an exceedingly harsh sentence for his part in the Stratfor hack, published progressively from 27th Feb 2012 by WikiLeaks as the G.I. 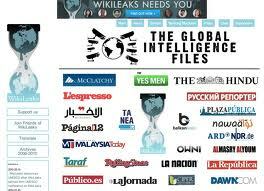 (or Global Intelligence) Files; information of great public interest, as WikiLeaks and other media around the world pointed out in a letter to the Judge. The material shows how a private intelligence agency works, and how they target individuals for their corporate and government clients. The Stratfor emails reveal a company that cultivates close ties with US government agencies and employs former US government staff. It is preparing the 3-year Forecast for the Commandant of the US Marine Corps, and it trains US marines and “other government intelligence agencies” in “becoming government Stratfors”. Stratfor’s Vice-President for Intelligence, Fred Burton, was formerly a special agent with the US State Department’s Diplomatic Security Service and was their Deputy Chief of the counterterrorism division. Despite the governmental ties, Stratfor and similar companies operate in complete secrecy with no political oversight or accountability. exposed the private security firm’s infiltration, monitoring and surveillance of protesters and dissidents, especially in the Occupy movement, on behalf of corporations and the national security state. And, perhaps most important, the information provided chilling evidence that anti-terrorism laws are being routinely used by the federal government to criminalize nonviolent, democratic dissent and falsely link dissidents to international terrorist organizations. 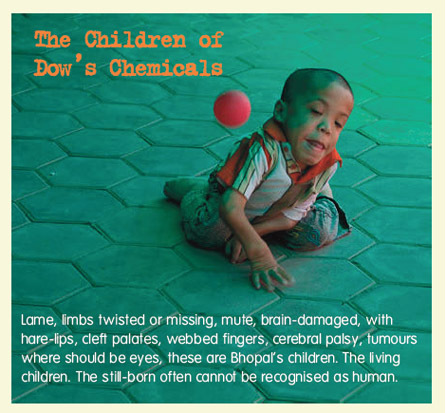 References to Julian Assange and/or WikiLeaks alone number more than 4000, and one of the emails talks of a ‘sealed indictment’ relating to Assange, while, disgustingly, the emails also reveal that the Bhopal Medical Appeal, a very small charity formed to help victims of the horrendous Bhopal Chemical Disaster, was spied on at the behest of Dow Chemical Co, the company who now own Union Carbide (owners of the infamous chemical plant at the time of the disaster). 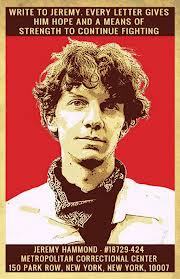 But back to Jeremy Hammond, himself. In common with far too many people caught up in US ‘justice’, Jeremy felt he had no choice but to accept a plea deal of a maximum sentence of 10 years in order to avoid the serious risk of a far longer sentence. Appallingly, the Judge – Loretta Preska, may-her-name-forever-be-synonymous-with-egregious-injustice (whose impartiality is also extremely dubious owing to her actually being married to one of the aggrieved ‘victims’ of the ‘crime’ ??!) has just sentenced Jeremy (whose life history to date positively teems with moral purpose) to the full bitter 10 years, plus a further 3 years supervised under such anachronistic restrictions as being forbidden the use of any anonymising tools such as Tor, and from associating with any ‘civil disobedience organisations’. One thing is sure; he does not deserve this vindictive, vicious sentence, that, like Chelsea’s sentence of 35 years, is designed as both a warning to other beautiful people and a vindication of the ugly ways of the ugly minded. Thus do the bankrupt powers that strut their stuff over us always respond to moral and political action. This isn’t how to fix things! 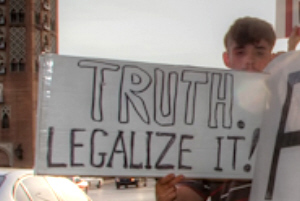 young, technically minded people from the generation that Barack Obama betrayed. They are the generation that grew up on the internet, and were shaped by it. And by trying to crush these young whistleblowers with espionage charges [note: or the arbitrarily applied Computer Fraud and Abuse Act – CFAA], the US government is taking on a generation, and that is a battle it is going to lose. This isn’t how to fix things. The US government is always going to need intelligence analysts and systems administrators, and they are going to have to hire them from this generation and the ones that follow it. Edward Snowden [exile], Barrett Brown [prison awaiting trial], Jeremy Hammond [prison – sentenced to 10 years], Aaron Swartz [driven to suicide], Gottfrid Svartholm [prison and being extradited to Denmark from his native Sweden to face further allegations], Jacob Appelbaum [exile], and Bradley (now Chelsea) Manning [prison – sentenced to 35 years]. All the above are young men who stand out as those who live/d by their principles. And obviously that says a helluva lot about the current order of things. You should read Jeremy Hammond’s 15th Nov 2013 statement published by Sparrow Media after the sentence here. November is a particularly dark month, and Jeremy’s persecution is a dark result that lowers our spirits, but we already know we are up against the darkness of cynical control structures – it’s not a surprise – and we do well to come together in solidarity because together we can support and encourage one another. Yes. 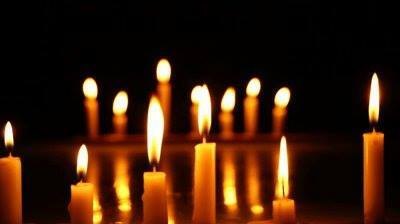 So, symbolically, on Thurs 28th Nov, let’s light 251 candles, and support one another. Come and join us at the Ecuadorian Embassy to light up the night! Gallery | This entry was posted in Analysis, Announcements, Assange, Manning and tagged Cablegate, candles, Chelsea Manning, dark, Ecuadorian Embassy, GI Files, Global Intelligence Files, Jeremy Hammond, Julian Assange, light, London, State Dept Cables, Stratfor, Trans Pacific Partnership, WikiLeaks. Bookmark the permalink. 7 Responses to Celebrate Cablegate with 251 Candles to Light up the Night! I can only be there in spirit… Good luck! 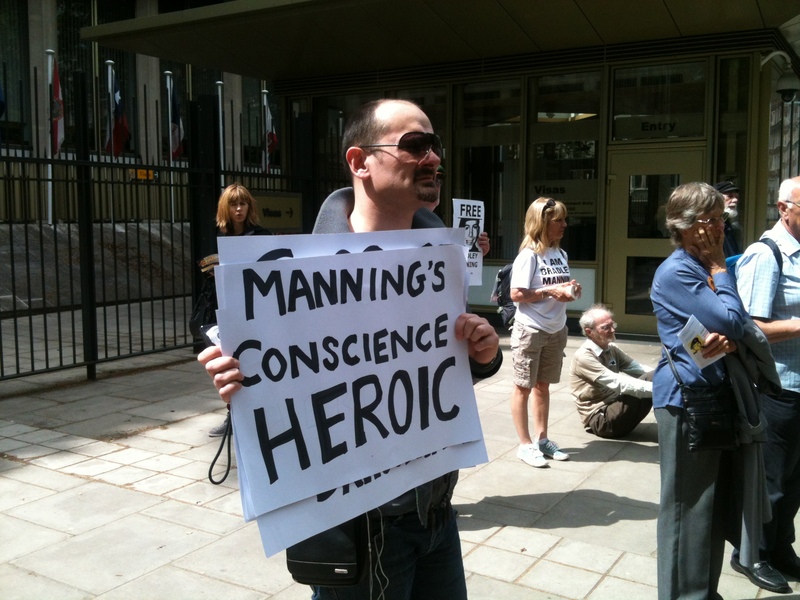 Free Chelsea Manning… Save Julian Assange NOW! My heart and soul are with you and with Julian Assange from across the ocean. It is a sickness in our society that imprisons good, honest people for the ‘sin’ of exposing the truth. Someday the world will remember Julian, Chelsea, Jeremy, and others as heroes. It is to our shame that they face persecution today. Pingback: Should What's Done in the Dark be brought to the light... and "hate clicked?